For excellent overall health, it’s important to have good oral health. When a tooth is cracked, damaged, fragile or worn out, a ceramic restoration is the preferred option to protect and strengthen the tooth, and to enable it to function properly. Since 1983, CEREC technology has been used to embellish smiles. At Centre Dentaire Ahuntsic, we’ve been using this technology since 1999 for our patients’ well-being. Always at the forefront of technological, state-of-the-art innovations, today we use the CEREC Omnicam, the very latest tool of its kind. CEREC is a computer-aided ceramic restoration technique. It takes digital impressions of the damaged tooth and creates a digital model that is perfectly adjusted to the patient’s mouth. Before inserting the artificial tooth, we polish and prep it so that it looks natural – just like your real teeth. CEREC produces beautiful results in only one appointment. What types of restorations are possible using CEREC? When can a patient benefit from CEREC-produced ceramic restorations? For more information on dental restorations and the many benefits of CEREC technology, contact the Centre Dentaire Ahuntsic team at 514-383-3666. We’ll be happy to answer your questions. The visible part of a tooth is called the crown. If it gets damaged, it’s important to protect the healthy portion of the tooth with a prosthetic crown. What does a crown look like? A crown is an artificial hollow tooth. Made of ceramic, composite resin and sometimes even gold, crowns are custom-made using dental impressions. The dentist will install the crown so that it completely covers the surface of the damaged tooth and blends in with the natural teeth. How is a crown installed? During the first appointment, the affected tooth is trimmed so that it is ready for the crown. A detailed impression is made of the affected tooth and the surrounding teeth. Then, using local anesthetic, a temporary crown is installed. The permanent crown is affixed using dental cement during the second appointment. After adjusting it and checking its shape and color, your tooth will regain its original appearance. How long a crown lasts varies by patient. Poor oral hygiene or bad habits, like nail chewing, can damage the crown. Dental sealants are used to prevent the formation of cavities on permanent molars and bicuspids. It is a preventive treatment that consists of applying a thin layer of sealant on the chewing surface of these teeth. Applying sealant is comparable to placing a white filling. The main difference is that there’s no need for anaesthesia, since no drilling is required. Why is sealant applied to molars and bicuspids? The natural grooves on the surface of these large teeth are difficult to properly clean, since a toothbrush’s bristles can’t reach deep enough. Food particles and plaque accumulate there, making it easier for cavities to form. Patients under the age of 15 are at higher risk of developing cavities. Patients aged 6 to 15 are more prone to have dental sealant applied to their molars and bicuspids. A baby tooth whose grooves are very deep could also benefit from this. For adults, dental sealant helps protect the enamel of their teeth. Digital x-rays are an essential diagnostic tool, enabling the dentist to see teeth, bones and gums. By revealing hidden problems, like an interdental cavity, x-rays help dentists propose the best treatment plans. Digital x-rays are safe, comfortable and an important tool. Digital x-rays use electronic captors instead of x-ray film. The images are saved automatically to the computer so that they can be accessed right away. What can digital x-rays reveal? There are many types of x-rays, each one with its own features to help dentists make precise diagnoses. The most used x-rays are bite-wing x-rays, taken during check-ups, and panoramic x-rays (Panorex). An implant-supported prosthesis can be partial or full. As its name states, this type of prosthesis requires dental implants. First, the jawbone mass is assessed to ensure that it can receive the implants. Otherwise, a bone graft may be needed. Are there any contraindications relating to implants? Good overall health and sufficient jawbone mass are required for implants. Certain illnesses or bone structures may prevent a patient from undergoing this procedure, in which case an alternative treatment would be proposed. What are the different types of implant-supported prostheses? Full dentures replace all the teeth on one or both dental arches. What are the benefits of this type of prosthesis? Just like with natural teeth, regular check-ups and good oral care will help keep your prostheses in good shape. A removable dental prosthesis is used to replace natural teeth. It can replace a few teeth (partial denture) or all teeth (full denture). Implants reinforce the stability of the prosthesis, giving you more confidence. How is this type of prosthesis removable? The prosthesis has an anchoring system for easy removal. The selected method depends on several functional factors, such as the position of the implants. One option is to use rounded pillars, where the artificial teeth can be snapped on to the implants. Another option is a bar-retained prosthesis, where a bar is permanently installed between the implants so that the prosthesis can be easily attached and removed. No matter which system is chosen, your prosthesis will remain solidly in place, giving you a natural-looking smile. A good mouthguard should be adapted to your mouth. Only a custom-made mouthguard can provide you with the highest level of protection. How is a custom-made mouthguard better than a commercial mouthguard? Custom-made mouthguards are made in the lab using a precise impression of your teeth. Depending on the sport you practice, the mouthguard can be reinforced in certain strategic spots. To best protect your mouth, a custom-made mouthguard is highly recommended. One of the main benefits is that it can be worn in conjunction with an orthodontic device. Mouthguards soften blows that could otherwise lead to serious injury, like a broken jaw. They can also help reduce the severity of head injuries, like concussions. Don’t all mouthguards have the same features? Commercial mouthguards, including those that take on the shape of your mouth, don’t meet optimal protection criteria. Although the second type is a better option, both of these models have their weak points that could lead to serious consequences. There are several options for replacing one or several missing teeth. A permanent bridge is one of the most common. What is a permanent bridge? A permanent bridge consists of an artificial tooth placed between two crowns. The tooth fills the empty space and the crowns are attached to adjacent teeth (also called pillars). Since the bridge is secured using dental cement, it is considered a permanent prosthesis and cannot be removed. The material and fabrication method are chosen based on your needs. The end result will be natural, beautiful-looking teeth. How is a permanent bridge installed? Installing a permanent bridge requires two or three appointments. Afterward, regular check-ups and good oral hygiene are needed to ensure the durability of your prosthesis. The field of periodontics is concerned by infections and other dysfunctions of the periodontium, which is comprised of the gum, alveolar bone, ligament and cementum. Together, these structures keep teeth in place. Periodontal disease occurs when these tissues become infected by bacteria. These types of infection need to be treated rapidly to avoid further complications and more complex treatments. Because it involves swelling of the gums, this type of infection is also known as gum disease. When plaque and tartar build up, the bone eventually becomes affected as well. Gum disease progresses slowly, is generally painless and almost asymptomatic. The most common forms of gum disease are gingivitis and periodontitis. First and foremost, periodontics focuses on prevention. During your regular check-up, the dentist will assess if you’re at risk of developing gum disease. If this is the case, a periodontal exam will be recommended. If you do have gum disease and it’s detected early on, it can be treated. In more serious cases, periodontics can stop the disease from progressing and re-establish your oral health. A rigorous approach to dental hygiene, healthy eating habits and regular dental check-ups are the best ways to prevent gum disease. Dental implants are artificial roots made of titanium. They are inserted wherever teeth are missing, to support replacement teeth. Minor surgery, spread out over several steps, is required to install them. How are dental implants installed? Some requirements must be met before having implants installed. You must be in excellent overall health, your gums must be healthy and your jawbone must be thick enough to hold the implant. If the bone is too thin, a bone graft may be needed. Will I be able to brush my teeth normally? Since the implant fuses to the bone, it can practically be treated just like a natural tooth. A toothbrush with longer bristles at the tip will help you reach the back of the implant. We recommend using dental floss at least once a day. The union between the implant and the gum must always be treated with care. When gums thin out, they can come loose, exposing roots and leading to many other problems. Called gingival recession, this problem can only be treated with a graft. A gum graft is a surgical procedure to repair and replenish areas where gums have weakened. The procedure aims to protect teeth and prevent further loosening. In some cases, it may be possible to use an inert membrane from a donor. This technique is called AlloDerm and it has the benefit of not needing a graft from the patient. Do grafts need to be redone later? For most patients who maintain good oral health, the benefits of a gum graft can last a lifetime. Gentle brushing using a soft-bristled brush will help you keep your new smile longer. A veneer is a thin shell made of porcelain or composite resin. It is secured to the visible side of one or several teeth. This cosmetic restoration can significantly improve your smile. What defects can veneers correct? Porcelain or composite – what’s the difference? The difference between these two materials resides primarily in the manufacturing and installation of the veneer. While both materials have their own benefits, we will assess which one best suits your needs. Both have a natural finish and are durable and stain-resistant. For this type of restoration, during the first appointment, a dental impression is made and a temporary veneer is installed while the permanent veneer is produced. Once the permanent veneer is ready, it is secured to the visible surface of the tooth during the second appointment. Composite veneers are affixed to teeth using an adhesive resin. Then, a polymerizing lamp hardens the composite. Veneers are then adjusted and polished so that they perfectly match the natural teeth. Endodontics is a discipline that focuses on the soft tissue within teeth. Called the dental pulp, this tissue contains the tooth’s nerves and blood vessels. When it gets damaged or infected, it needs to be removed. This intervention is called a root canal or endodontic treatment. How does dental pulp become infected? Dental pulp is protected by the tooth’s hard shell. Sometimes, a defective restoration, injury, broken tooth or deep cavity exposes the pulp. Bacteria can then attack and contaminate the nerves. An x-ray can confirm an infection and the presence of an abscess. Endodontic treatments are usually painless and can save a tooth that would otherwise have been extracted. There are 20 primary teeth. The first teeth appear around six months, with the final teeth erupting by age three. How do I know if my baby’s teeth are coming in? Fever is not a symptom of teething. If your child is feverish, see your pediatrician. How can I relieve my baby’s discomfort? Primary teeth erupt in phases. Incisors (the middle front teeth) often come in first, followed by molars and canines. The enamel on primary teeth is thin and more prone to early-childhood cavities. To prevent them from forming, proper oral healthcare is important as soon as your baby’s first tooth appears, or earlier. Come see us today with your little ones. We can give you tips on how to care for your child’s teeth and answer any questions you may have. Permanent teeth begin to appear around the age of six and grow for a few years. There are 32 permanent teeth (including wisdom teeth) and they’re usually a bit more yellow than primary teeth. How do I know if my child’s teeth are growing properly? All the way in the back of the mouth, behind the last baby tooth, the first molar makes its debut. It does not replace another tooth. Then, the four front teeth appear on the top and bottom (incisors). Between the ages of 10 and 12, the canines and bicuspids erupt. Second molars appear around the age of 13 and wisdom teeth begin coming in at the end of adolescence or in the early 20s. Can permanent teeth cause problems as they erupt? Lack of space could lead to overcrowding and malocclusion. As each child is different, the sequence and age when teeth erupt varies. By taking x-rays and performing regular dental check-ups, we can monitor the progression of your child’s permanent teeth. This way, we’ll be able to address any problems early on and keep consequences to a minimum. Wisdom teeth usually come in when a patient is near the end of adolescence or in their mid-20s. Also called third molars, wisdom teeth are found at the back of the dental arch. Although most people have four of them, having less or none at all is not uncommon. Do wisdom teeth have to be extracted? Not everyone needs to have their wisdom teeth removed. In fact, many people keep them all of their life. However, if space is an issue, yours may need to be removed for preventive reasons. If your mouth is too small for your wisdom teeth to come in properly, they could become partially or fully impacted in the jawbone, which would require an intervention. There are a many signs to indicate that the third molars are erupting. Pain is a first indicator, and it usually comes and goes over a few days. Another common symptom is bleeding gums near the back of the mouth. Patients may also experience tense jaw muscles, swelling or cysts. Extracting the wisdom teeth may be needed to relieve the pain and to prevent unpleasant consequences. Since lack of space is often the source of the problem, letting the wisdom teeth come in anyway may lead to dental overlapping and a higher risk of developing carious lesions. Today, technological equipment is wholly integrated into dentistry. For example, the intra-oral camera helps dentists see very small areas that are at a higher risk of becoming problematic. This non-intrusive, pen-sized tool has a digital camera on one end. On the other end, it’s connected to our computer so that scanned areas can be seen on screen. In this way, the intra-oral camera is also a communication tool that makes it easy for a dentist to point out an issue or explain a procedure. What does the camera pick up? One of the biggest benefits of this digital technology is the ability to enlarge and adjust the images, making it easier to detect cavities, cracks, defective restorations and soft tissue problems that would normally be difficult to see with the naked eye. Although it cannot replace an exam or x-rays, the intra-oral camera helps the dentist make a precise diagnosis for an adapted care protocol. What are the benefits of using an intra-oral camera? Commonly referred to as “teeth grinding,” bruxism is the grinding or gritting of teeth caused by involuntary contractions of the jaw. Although it mostly occurs at night, bruxism can also happen during the day and be a recurring problem throughout your life. What are the consequences of grinding your teeth? As of yet, there is still no international consensus on the subject. But we are getting pretty clear understanding of the various causes of bruxism. For many people, an occlusal imbalance is the main precursor while stress makes it worse. Relaxation exercises and using a bite plate or even occlusal equilibration can minimize the damage bruxism can have on your teeth. If you’re feeling discomfort or pain in the joints located on either side of your face, in front of your ears, you may have a temporomandibular joint disorder (TMD). Although the causes vary, bruxism, an injury or a joint-related illness may be at the root of the TMD. What are the main symptoms of a TMD? A dental check-up can confirm whether or not you’re suffering from a temporomandibular joint disorder. We’ll assess your best treatment options and discuss how you can prevent and minimize TMD symptoms. Custom-made bite plates are made of acrylic and are worn over the top OR bottom teeth. Mainly recommended for patients suffering from bruxism, the device acts as a cushion. By absorbing the pressure exerted by the teeth, the bite plate helps minimize damage caused by grinding or gritting. Bite plates can also help relax and soothe jaw muscles and TMJs. The occlusal equilibration is a simple and conservative treatment that can be used alone or with other treatments (orthodontics, restorations, crowns and veneer, orthognathic surgery, etc.). It can help you control your TMD and TMJ pain on a 24 h basis. Teeth whitening is a cosmetic procedure. Due to its popularity, a wide range of products are available in drug stores, but nothing beats professional teeth whitening. First, make an appointment with your dentist for a complete check-up. This will help us determine the cause of your enamel’s discoloration and assess whether a whitening treatment will be successful. We’ll recommend a personalized teeth whitening treatment that will give you the results you’re looking for. It all depends on your needs and timeframe. In-clinic whitening will give you quick results. A dentist-supervised at-home whitening treatment is also very effective, but it requires several days of treatment. Although the teeth whitening process is progressive, you’ll see results after the very first application. Talk to your dentist to discuss which option is best for you. Yes. Your teeth will stay white for one to two years, depending on your oral hygiene. A follow-up treatment is also needed every 12 to 24 months. Are you currently doing an at-home teeth whitening treatment? Read our checklist for optimal results. Inlays are used to repair damaged teeth or unsightly or deteriorated fillings. They are used inside molars and bicuspids to avoid having to remove the tooth’s dental pulp. What are the benefits of using CEREC? A CEREC inlay is a custom-made ceramic restoration made in the clinic. In only one appointment, your amalgam or composite resin fillings can be replaced with a beautiful inlay that will give your tooth its optimal function. With CEREC technology, you can have a permanent, custom-made restoration that looks natural, all in one appointment. A tooth can sustain different kinds of injuries that may necessitate a dental crown. But thanks to state-of-the-art equipment, this type of restoration can be done in just one appointment. A CEREC crown is a porcelain prosthesis made using computer-aided technology. The main difference between a CEREC crown and a traditional crown is production time. 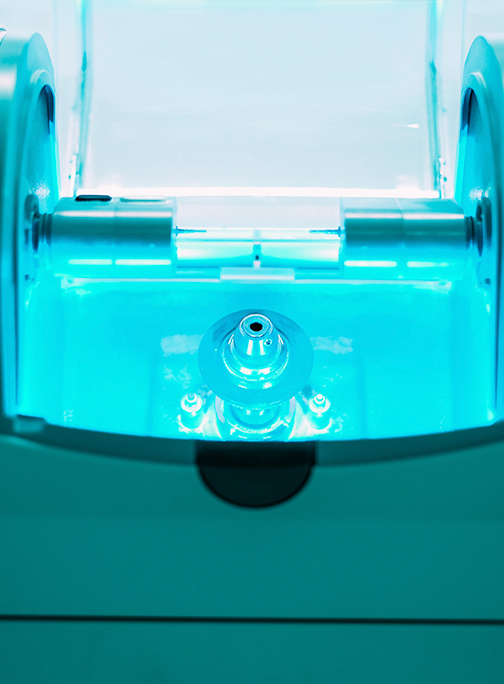 Unlike lab-made restorations, CEREC crowns are made on site. This means that in just one appointment, we can prep the damaged tooth, make the prosthesis and install it. How is the crown made? We’ve been proudly offering our patients CEREC technology since 1999, resulting very high quality, beautiful and durable restorations in just one appointment.